Dr. Kaelin: Vascular Surgery Associates was started specifically for the care and treatment of peripheral vascular issues. Peripheral vascular means all the blood vessels except the heart and the brain. This is important because this is our focus just as there are specialties that focus on the heart. Our specialty includes specific training and board certification for arterial and venous issues. Our primary focus is on the identification and management of these issues. Most of the problems we manage do not require surgical or even minimally invasive procedures. They can be managed medically and in conjunction with the primary care physician. When specific intervention is required most people can have an outpatient minimally invasive procedure. Dr. Kaelin: We have board certified providers, specific vascular trained ARNP’s and PA. We have an efficient office staff with inhouse non-invasive and inhouse interventional suite, so most things can be done right in the office. 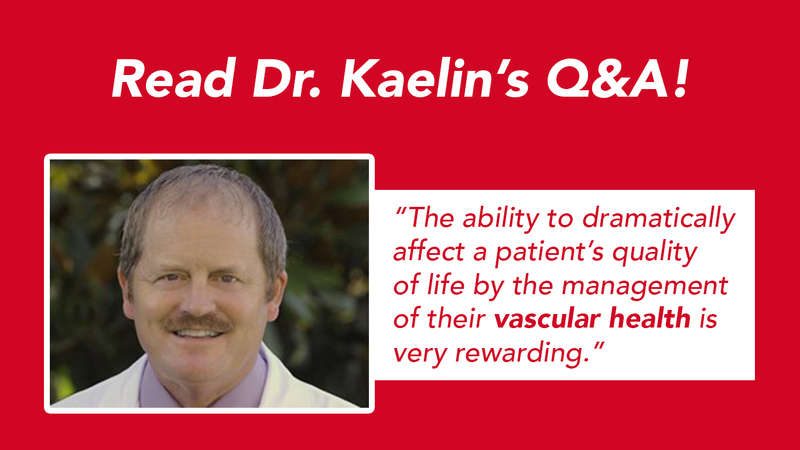 Dr. Kaelin: The ability to dramatically affect a patient’s quality of life by the management of their vascular health is very rewarding. Dr. Kaelin: It has changed the treatment of vascular issues that require intervention from 90% surgical to 90% minimally invasive. Dr. Kaelin: Aortic aneurysm stents, peripheral atherectomy devices to reopen lower extremity vessels through a catheter as an outpatient without bypass, significant improvement in imaging and diagnostic tools, and improved medical options. Dr. Kaelin: Poor vascular health can lead to heart attack, stroke, amputation and death. Dr. Kaelin: Discussion with their primary care physician about risk factors and appropriate screening. Dr. Kaelin: Very important as it improves overall vascular health. Dr. Kaelin: Diet depends on medical issues. There are many types of “diets” and these should be discussed with the primary care physician to make sure the right choices are being made. Dr. Kaelin: A Patient came to the ER with a ruptured abdominal aortic aneurysm that in the past would have required 10-14 days in the hospital and 3-4 months of recovery. We were able to fix it with a minimally invasive procedure, and they went home the next day and back to their usual activities within 2 weeks.